For the love of our oceans, we couldn’t let the latest group of Borneo Adventurers leave without understanding the importance of our coral reefs. Our Borneo Adventure program has, over the last 2 years, brought numerous groups of European adventurers to Borneo, where they have learned much about our jungles and seas. Through the program the aventurers experience Sabah for a month, meeting the people, trekking jungles, climbing mountains and, of course, learning how to dive. Richard Swann, our resident PADI Course Director and avid Marine Biologist, has long ago decreed that ecological awareness will be part of all our group programs. So it was then that our 10 adventurers learned about the new tourist destinations that became accessible to them after they qualified as PADI Open Water Scuba Divers. 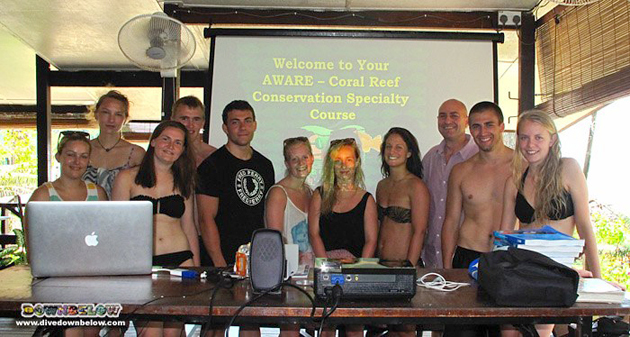 Through Project AWARE’s Corel Reef Conservation Speciality, the group learned about the importance and sensitivities of our reefs, what threatens it and how they, newly qualified divers, can play a part in protecting our valuable reefs. At the end of September, 10 enthusiastic, knowledgble AWARE Coral Reef Conservation divers departed our dive centre on Gaya island in Kota Kinabalu. 1 by 1, or ten at a time, we strengthen our numbers, and together we make a difference to our ocean and our planet.